Gentlemen’s Hardware has all the adventure essentials you could possibly need. From enamel mugs to multi-tools, you will always be ready for what is ahead! The products have been crafted for the rigors of today’s modern life with a vintage aesthetic. Discover our iconic Gentlemen’s Hardware Enamelware collection – from mountain hikes to camping in the great outdoors, this trusty, hardwearing collection has been taken and photographed all around the world. This popular Gentlemen’s Hardware enamel mug will handle the knocks of your travels. It bears the motto ‘The Adventure Begins’ to remind you of the thirsty work to come. On the base of the mug is a compass detail that contributes to the overall simple yet stylish design. It is ideal for camping, festivals or even adventures that are closer to home. The mug is thinner than a regular mug making it easier to travel with and less likely to break or get damaged. The thinness of the mug also allows heat to transfer quicker to be careful with extremely hot liquids. 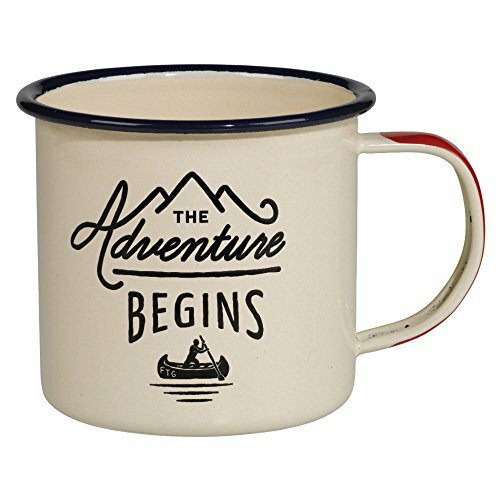 The enamel may chip off the mug, but this adds character and displays the shared adventures that this mug went on with you. While it may get hot from hot liquid, this mug is not suitable for microwave use and it is recommended that the mug be cleaned by hand washing only. It can hold up to about 12 fl oz and the dimensions are 3.5” x 3.5” x 3”. This particular enamel mug comes in the color cream but it is also available in the color blue. This mug is truly an excellent product for TRUE gents! Manufacturer: Wild and Wolf Inc. Publisher: Wild and Wolf Inc. Studio: Wild and Wolf Inc. If you have any questions about this product by Gentlemen's Hardware, contact us by completing and submitting the form below. If you are looking for a specif part number, please include it with your message.